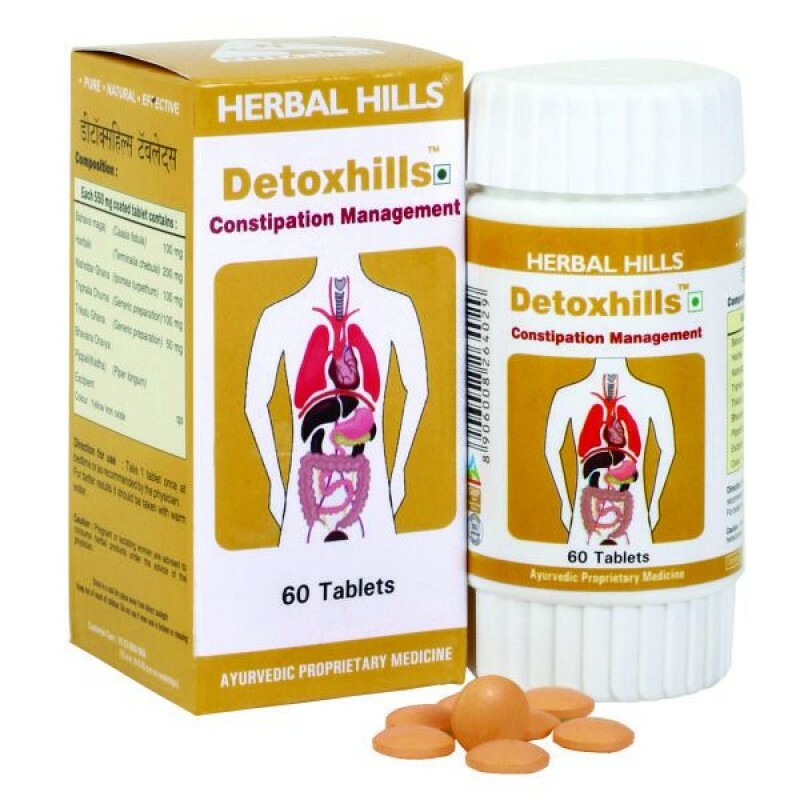 Detoxhills 60 tablets : Constipation Management Main Ingredients: Triphala, Trikatu, Harde, Bahava Magaj Detoxhills is a unique ayurvedic herbal blend of all natural herbs - Triphala : It is the combination of 3 fruits viz: Amla, Baheda & Harde in equal proportions. It is historically used as laxative & an effective colon cleanser. It not only helps clean the bowels, but also aids in digestion. - Trikatu : It is the combination of Sunthee, Miri, Pippali. The unique combination works as an appetizer, digestive & stimulates various metabolic activities which are helpful in digestion - Harde : Supports normal detoxification of the digestive tract and normal bowel movements - Bahava Magaj with its mild purgative activity, cleanses colon & detoxifies digestive tract without causing dehydration.Benefits : - Supports normal bowel functions. - Helps in detoxifying digestive toxins & thus aid digestion. - Helps in relieving occasional constipation. -Supports healthy digestion.